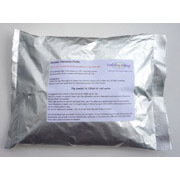 Premium grade alginate impression powder with 4 moulding bags to make 4 high definition moulds of a baby 0-6m, 2-3 of a toddler or 1 clasped hands mould. 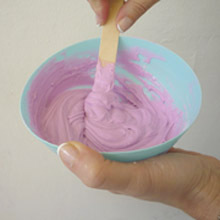 The impression mixture will change from Pink to White so you know exactly when it is set. Premium grade alginate impression powder to make 4 high definition moulds of a baby 0-6m, 2-3 of a toddler or 1 parent and baby clasping hands mould. Totally safe and made from seaweed. Our impression material comes in a foil-sealed pack for freshness. Once opened it can be sealed in an airtight container for up to 1 year. 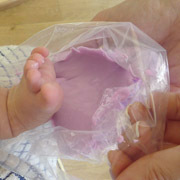 Please note: To make baby casts you need impression powder to make the mould and plaster to make the cast. This item is just the impression powder to make the moulds but with no moulding instructions. 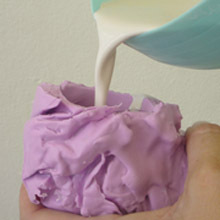 If you have never made baby casts before you will need to buy the full Life Casting Kit - No Frame - Up to 4 casts which contains everything you need to make your moulds and casts including the paint and full detailed instructions.